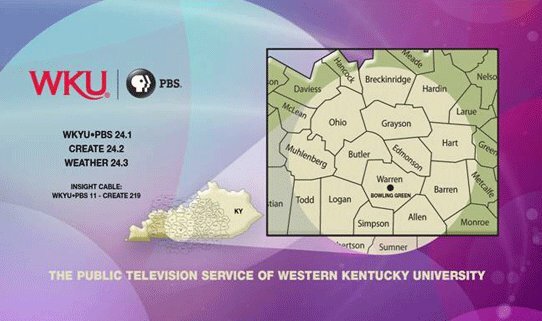 WKU PBS can be seen across more than 15 counties in western Kentucky, as well as on cable. Depending on your location, WKU PBS may be seen on a different over-the-air channel. Find us based on your city. Educational Telecommunications is responsible for two campus cable systems. Western Cable serves all student areas on campus. Academic Cable serves learning areas on campus. This system feeds every residence hall with over 65 channels of entertainment and educational cable services. SCOLA provides international television programs from eastern Europe and Asia. Contact WKU Office of Residence Life for questions. This second system feeds classrooms throughout campus for use during classes. The system is used to provide satellite delivered videoconferences to rooms all around campus. This system feeds classrooms and learning areas with 25 channels educational cable services. SCOLA provides international television programs from eastern Europe and Asia.